There are lot of web browsers available out there like Mozilla,Opera,Google Chrome,Internet Explorer.But there is a browser which is quite different from all these browser.It is different in the sense that is specially created for Indians by Indians. 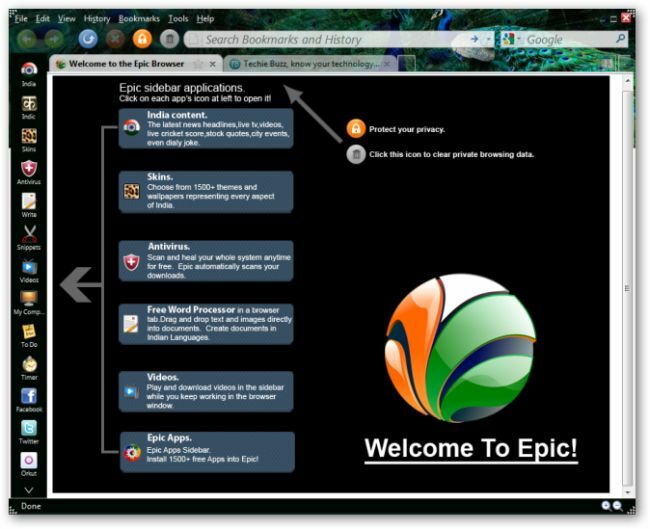 A Bangalore based startup called Hidden Reflex has made available a browser called as the “Epic Browser”. Epic Browser is a Internet web browser which is based on Mozilla Firefox, which taps into several services to serve content which is useful and relevant to Indian users. Among other things, it uses Google Indic Transliteration tool to enable typing in Indian languages like Hindi, Bengali and Tamil. The custom sidebar also offers one-click access to regional and national news including live video streams (served by NDTV), cricket match scores, share market updates and music charts. Epic also provides box file backup (through Gmail), mail (Yahoo and Gmail) and social networking (Facebook, Twitter and Orkut) apps. Additional security is provided through ESET NOD32 and WOT. If you want more you can always install more apps from Epic’s online gallery, which currently houses more than 1,500 applications. Additionally, since Epic is based on Firefox, it also supports standard Firefox extensions. Blazing Fast- Built on the latest Mozilla similar to Firefox. Maximum Security for your Browser- Malicious Website Warnings: We’ll warn you if you are about to visit a website known to host viruses. Get protection against over 3 million malicious sites. Sidebar Applications- 1500+ FREE apps that install instantly. 2500+ Indian Themes and Wallpapers- Personalize Epic. Epic is the first browser to offer full-screen wallpaper images. Type in 12 Indian Languages Easily- With one-click in any text-box, start typing in any of 12 Indian languages. Type how the word sounds in English, and Epic will convert it to the Indic language. Leading Sources. Regional and Hindi Language News. Events. Even a Daily Joke. 18 Live TV Stations. 200+ TV Shows. Films- In the India Sidebar, watch 18 different live tv stations, watch tv shows from over 40 channels and hundreds of films in 7 different languages! Video Picture-in Picture Sidebar .Youtube Video Download Button- More Videos from any site to the sidebar for picture-in picture like support & download videos. new tweets, e-mails and facebook posts. On the whole, Epic impressed me with its features as well as overall execution. It’s a lot more than just another Firefox port, which is what I had initially expected it to be. The fact that it is built on top of Firefox, which is already fairly popular, should come to its advantage.